The Saga Blend No 7 is one of two lines offered by De Los Reyes Cigars. The company is run by the Reyes family who have six generations of experience in the cigar business. The Reyes family has been involved in the tobacco growing and leaf brokerage business for over 160 years. They have also operated its own factory and have produced their own brands. From the fifth generation, Augusto Reyes still runs the company and from the sixth generation his daughter Nikra serves as President. Meanwhile, Augusto’s brother Leo runs the growing operations and is one of the biggest growers of Habano seeds in the Dominican Republic. Over the past year, the company rebranded itself from Corporacion Cigar Export (CCE) to De Los Reyes Cigars. In 2014, it also launched the Saga line of cigars which have become the centerpiece of the company’s portfolio. 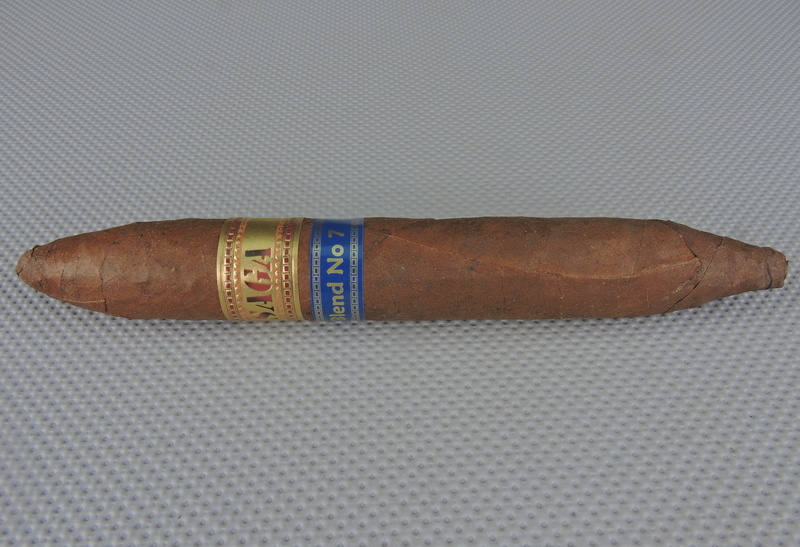 Today I take a closer look at one of those lines, the Saga Blend No 7 in the perfecto format. Overall this is an outstanding cigar and one that really shines in the perfecto vitola. The theme of the Saga Blend No 7 incorporates traditional tobaccos to deliver a a contemporary smoke for today’s cigar enthusiasts. The cigar itself is a multi-national blend. This contrasts with the other cigar in the line, the Saga Golden Age which is a Dominican puro that is intended to be a throwback cigar to the times of Ernest Hemingway. Without further ado, let’s take a closer look at the Saga Blend No 7 Perfecto and see what this cigar brings to the table. As mentioned, the Saga Blend No 7 is a multi-national blend. The cigar is highlighted by its Brazilian wrapper but incorporates Dominican tobaccos from the Reyes farms. The Saga Blend No 7 is being launched in three sizes. Each of the three sizes are available in 20 count boxes. The Brazilian wrapper to the Saga Blend No 7 Perfecto has a medium coffee bean color to it. There is a colorado red tint on the cigar. This wrapper has a bit of a rugged look to it, but it also gives the cigar a lot of charm. There are some visible veins and visible wrapper seams. In addition, the cigar also has a thin coating of oil on the surface. The perfecto has a nozzle-like shape by the footer and a gentle taper by the cap. There are two bands on the Saga Blend No 7. The primary band is gold in color. Prominently displayed on the middle of the band is the text “SAGA” in a modern red-colored font. There is a row of a gold rivet-like design above and below the text. There is also two row of red rivets toward the top and bottom of the band. The secondary band is blue in color. The band features the text “Blend No 7” in gold font. There is a row of square shaped gold adornments across the top and bottom. Before lighting up the Saga Blend No 7 Perfecto, I went with a straight cut. As I have being doing with all of my figurados and perfectos, I used my Credo Special T cutter with the 36 ring gauge hole to get an ideal cut for this perfecto. Once the cap was removed, I moved on to the pre-light draw phase. The dry draw provided a mix of cedar notes and natural tobacco. The natural tobacco notes provided a subtle sweetness. Overall I considered this to be a satisfactory pre-light draw in my book. At this point I was ready to light up my Saga Blend No 7 Perfecto and see what the smoking experience would deliver. The Saga No 7 Perfecto delivered a mix of cedar, natural tobacco, and cream notes. The cedar and cream notes moved into the forefront early on while the natural tobacco notes became secondary. The combination of cedar and cream worked real well and delivered a nice smoothness out of the gate. Meanwhile there definitely was a cedar note on the retro-hale. Once the perfecto burns to the main base of the cigar, the cedar note takes on a hickory quality. This cedar / hickory combination became the primary note. The cream note was a close secondary note while the natural tobacco flavor is a little more distant. During the second third, the cedar / hickory combination remained primary. By the midway point, the natural tobacco morphed into more of a coffee note. The cream notes diminished but I did detect a slight red pepper note in the distant background. I found this flavor profile continued throughout the second half. Toward the end, I did notice an increase in spice. This is the way the flavor profile came to an end. The resulting nub was soft to the touch, but cool in temperature. The Saga Blend No 7 is a very good burning perfecto. Overall I found this cigar to have a low maintenance burn. The burn path remained straight from start to finish. There was a slight jaggedness on the burn line itself, but this was easily remedied with some occasional touch-ups. The resulting ash was charcoal gray. The ash wasn’t overly firm, but it wasn’t a loose ash either. The burn rate and burn temperature were ideal. The draw was very good too. This was a draw that was not too tight, nor too loose. It made the Saga Blend No. 7 an enjoyable smoke from start to finish. From a strength perspective, I found the Saga Blend No 7 Perfecto started out medium. There was a slight increase in strength and by the second half, I found the strength had crossed into medium to full territory. 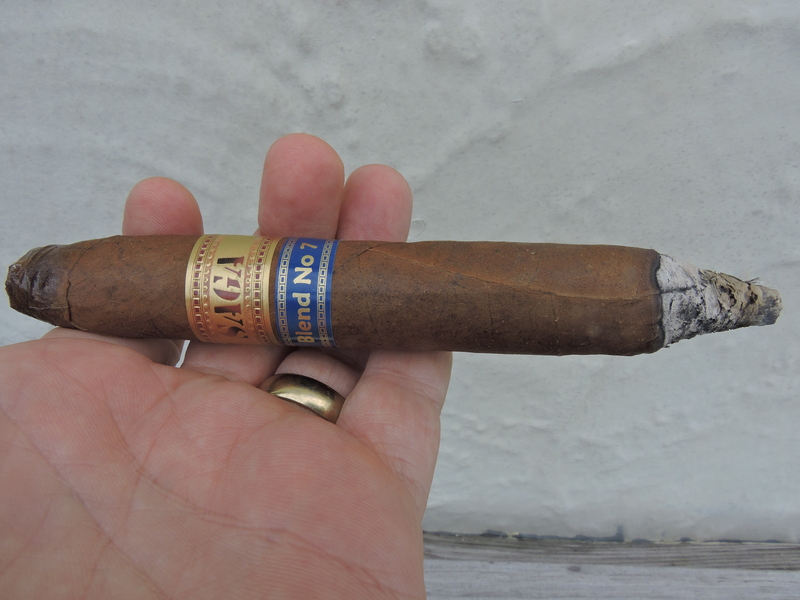 Factoring in the retro-hale, I found the Blend No 7 Perfecto to perform as a full-bodied smoke from start to finish. Overall I found when it came to strength versus body, the edge went to the body. Overall I have really enjoyed the sizes of the Saga Blend No 7 and to me the Perfecto size really does this blend justice. There is a nice amount of complexity in this cigar – and that is something that I really think appeals to the contemporary cigar smoker. On top of that, there are some really nice classic flavors along the way. I also found this to be a well-made cigar. Combine great flavor, a nice amount of complexity, excellent construction, and an attractive $7.49 price point – and this cigar is the total package. This is a cigar I’d recommend to a seasoned cigar enthusiast, but it’s also a nice cigar for a novice looking for something a little fuller. As for myself, this is a cigar I would definitely smoke again – and it’s easily a box worthy cigar.